Here is my article as published in this months West Cork People. There are loads of advice articles online but here is my tuppence worth! The image above is by Dasha Caffrey. Don't worry about knowing the names of particular flowers...unless they have a particular significance for you. It's more important to have an idea about the overall style you like and the colour scheme (if there is one). One bride-to-be came to me with a very simple 'mood board' which I found extremely helpful. She had chosen images that she liked – showing flowers, fabric, accessories etc. The idea was not to recreate these exactly but to achieve a similar overall mood. Just the process of selecting these images would help to firm up on the type of look you are really drawn towards. Pictures always help to avoid any misunderstandings too...it's much easier to point at what you want rather than attempting to describe it in words! Pale colours have been very popular for a while now – especially any apricot/peachy tones and pale pink, combined with white or cream. It's easy to see why, they are beautifully soft and delicate. Using different types of greenery can make this look much more interesting and natural. Little accents of colour are sometimes all it takes to make a bouquet stand out. A clashing colour like deep yellow or dark blue, used sparingly amongst pastels, can change the whole look and make it just a little more edgy. The use of long trailing ribbons to tie the bouquet is a nice way to add colour also - and a good way to tie in with what the men in the bridal party are wearing. Colour is often used in a way that signals the season – e.g. primrose yellow or pale blue/lilac in spring or deep reds and oranges in late summer. Things that aren't flowers at all are figuring more and more wedding floristry. Bouquets can be made purely from foliage in many shades of green from lime through to blue/grey. Seed heads and ornamental grasses bring texture and lightness. Succulents (the little geometric house plants that are sometimes confused with cacti) and berries make great focal points. These very much depend on your budget. For church weddings it's worth thinking about where you can make the most impact. Some altars are already very ornate and beautiful as they are, while a generous, really full arrangement that the guests will pass on the way to their seats may be appreciated more. More and more wedding ceremonies are taking place in secular venues. A structure like an arch, decorated with flowers and foliage, can really help as a focal point and backdrop for the ceremony itself. Any large arrangements or installations will look best if they are against a relatively plain background. Arrangements that can be used for both the ceremony and the reception afterwards are very popular and 'pew-end' jam-jars of flowers are ideal for this. They are small enough to be hung from a pew or chair back, easy to transport, and look lovely grouped in twos or threes on tables later. The bridal party flowers will look fresh for longer if they can be kept in water and somewhere cool until they are needed. Try to keep the ribbons dry when placing bouquets in vases of water. 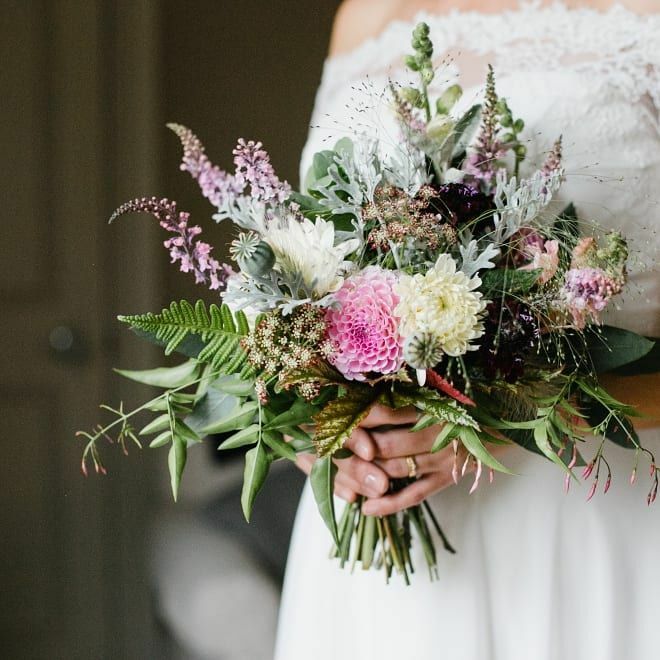 Bouquets sometimes have a front and back – just being aware of this in advance means they will be held the right way round. It's okay to practice in front of a mirror – holding a bouquet is not something most of us do too often! Equally it's worth ensuring someone knows how to pin buttonholes properly – there is nothing worse than a lop-sided buttonhole in your favourite wedding photograph. There are You Tube videos for this! Finally – choose a florist that you are happy to work with and whose style fits yours. It's a rare chance to surround yourself with beautiful blooms so enjoy it!